The 52-year-old seasoned actor was candid about his struggle with alcoholism and depression following his stroke and later, breakup with estranged wife Yayo Aguila in 2010. 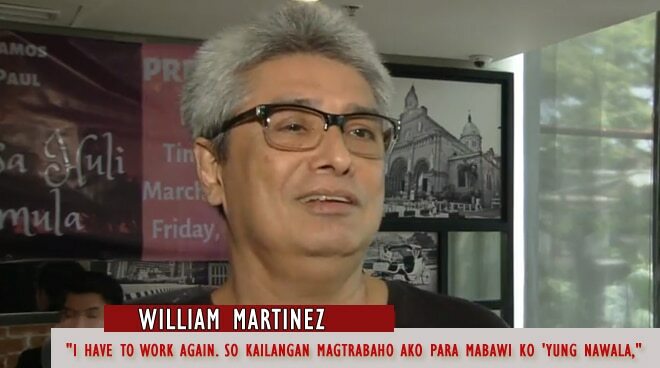 After nine years of absence, William Martinez is back in showbiz through his new film titled 'Bakit Naging Huli Ang Simula'. During his interview with ABS-CBN News on Monday, the 52-year-old seasoned actor was candid about his struggle with alcoholism and depression following his stroke and later, his breakup with estranged wife Yayo Aguila in 2010. They have been married for 25 years. "Matagal na pahinga, mga nine years. Boring, walang ginawa kung hindi manood ng TV every day. Noong 2010 - 2019, naubos ang pera ko. Nagbenta na 'ko ng mga kotse. Wala na," he said. "I have to work again. So kailangan magtrabaho ako para mabawi ko 'yung nawala," he added. Meanwhile, his brother Albert Martinez couldn't be any happier for William now that he's back on his feet. "I'm very thankful sa mga taong nagbibigay sa kanya ng second chance because I believe that William has the passion and talent to do it," he told ABS-CBN News. It was also revealed that William will be starring in another film with Yayo soon. Of their current relationship, he said, "Basta happy siya, happy ako."